Understanding how an urban space has changed over time is difficult to comprehend textually without visual documentation. In order to negotiate this, I supplemented my traditional thesis with a website. One can be innovative with a website, from utilizing photo-sharing websites like Flickr to GIS applications like Google Earth. 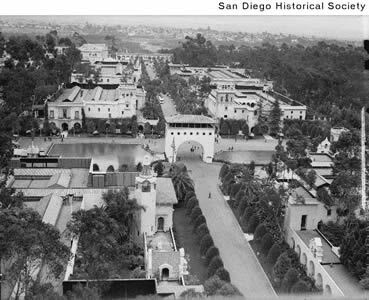 With its ability to provide a multimedia experience, including the physical changes and uses, this website will allow the visitor to witness the transformation of Balboa Park from the early 1900s to the 1980s. 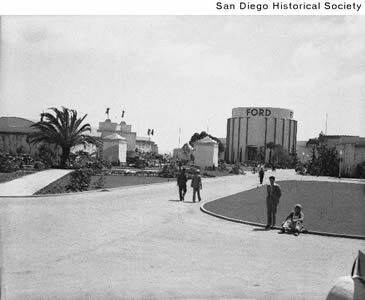 This visual essay will consist of three sections: analysis of physical changes, the effects of urban growth on Balboa Park, and most importantly, the changing uses of the park. For detailed information on the effects of these changes, please click the links on the left. 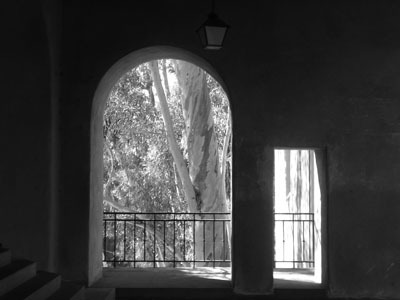 View looking out at Cabrillo Bridge from the California Quadrangle. Bertram Grosvenor Goodhue, The Architecture and the Gardens of the San Diego Exposition (San Francisco: Paul Elder & Company, 1916). 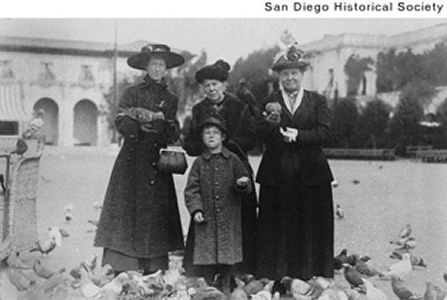 All photos stamped with "San Diego Historical Society" can be found online by clicking here. 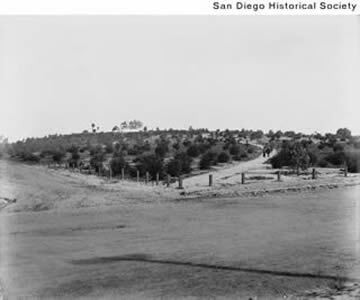 When space was set aside in the late 1860s for a public park in San Diego, it was on the outskirts of the city. Consisting of valleys and low scrub brush, its use was incongruous at best, ranging from an orphanage to an ammunition dump. 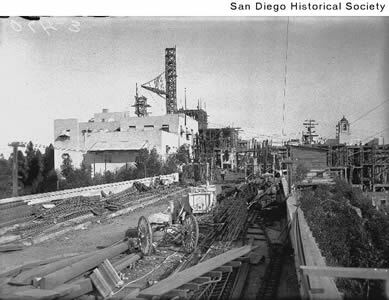 Construction for the 1915 Panama-California Exposition began in the 1910s, and reflected the control civic leaders exerted on the public space. The architecture was designed in a manner befitting the false Spanish heritage, a predominant in the region. For the 1935 California Pacific International Exposition a combination of civic leaders, the federal government and national corporations controlled the urban space. They left evidence of the themes of progress and beauty, manifested through the construction of new buildings as well as changes to the existing 1915 buildings. One example is the Ford Building, with its modern architecture and gear shaped design. The Air and Space Museum (Formerly the Ford Building) in 2009. 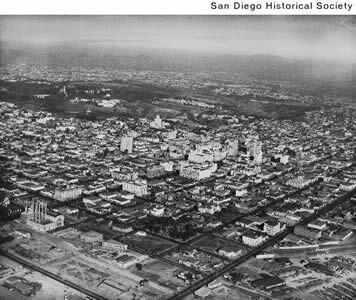 As stated before, urban growth has played a dominant, and detrimental, role in the history of Balboa Park. Once on the periphery of the park, urban sprawl has slowly intruded into park land. 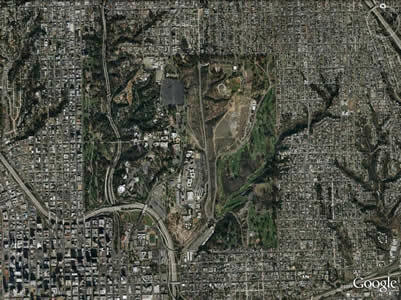 Two schools, the Naval Hospital, and a freeway have reduced the park's land from 1400 to 1100 acres. The Naval Hospital in 2009. 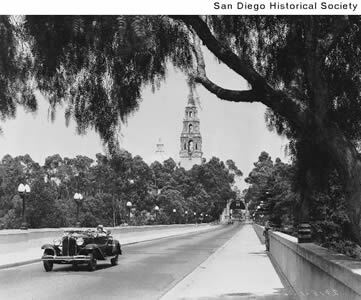 Construction of Highway 163 through Balboa Park occurred in 1948. 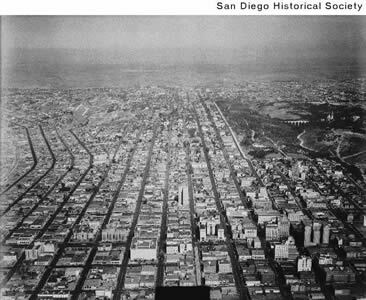 The following aerial views allow the viewer evidence of how San Diego quickly advanced, and enveloped, Balboa Park. 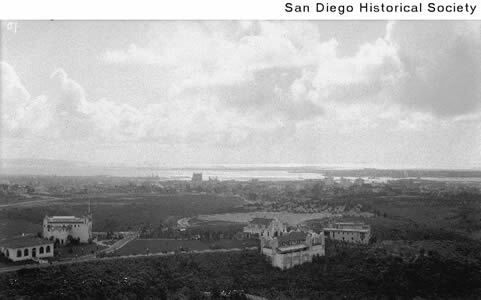 Visitors to the 1915 exposition recall seeing the lights of their magic city far off in the distance. By the late 1920s, the city had nearly surrounded the park. 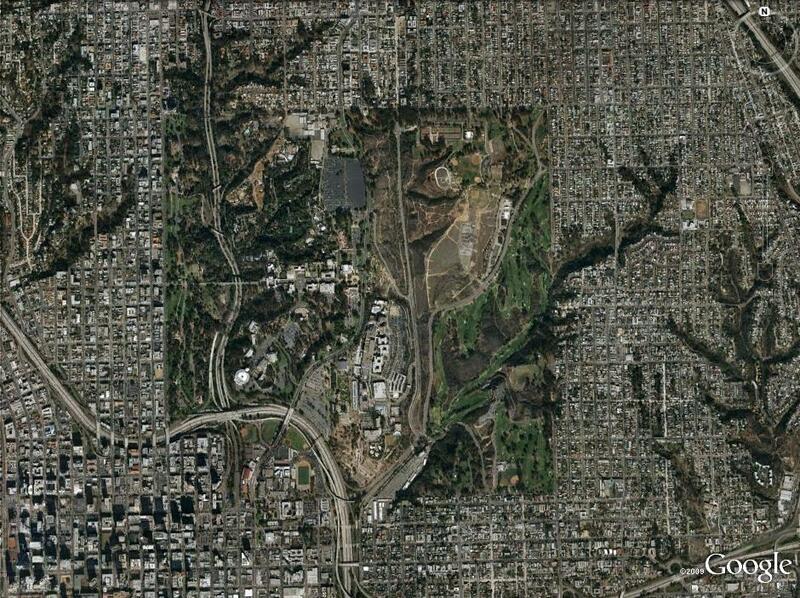 The last picture, a snapshot of the park taken by Google Earth illustrates the extent of the sprawl and incursion. Highway 163 runs through the western side, severely limiting access of that portion of the park. 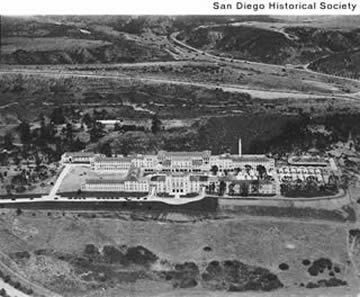 The Naval Hospital and accompanying facilities, located in the lower center of the picture, also reduces park space for visitors. The two schools, one in the southwest and the other northwest of the parking lot, also have advanced into park territory. 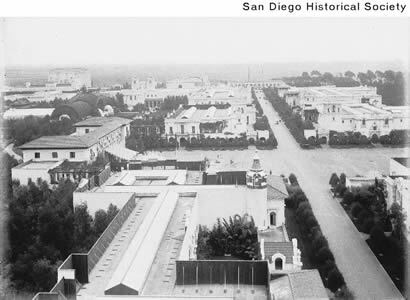 The following three photos from the early 1900s examine the shifting uses of Balboa Park. 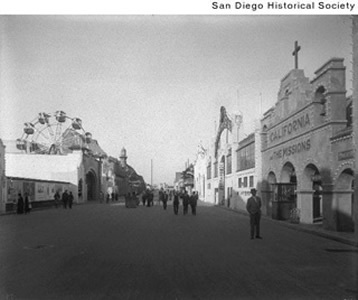 Visitors to the 1915 exposition had little agency in the creation and identity of the space. They consumed the memories and themes San Diegan boosters created. Note on the third photograph an exhibit on California missions on the right side. 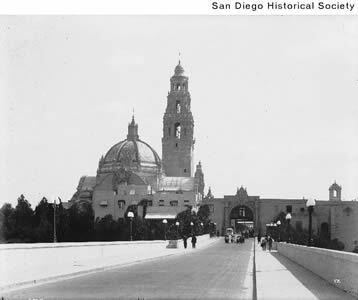 The Navy also represented a change in the use of Balboa Park during both world wars. 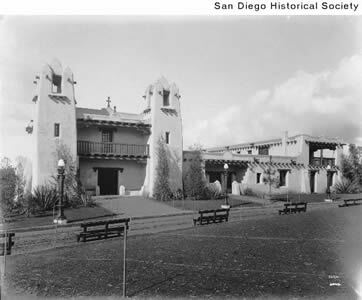 The first photograph is of the New Mexico building, built for the 1915 exposition. Its intended use at the time was to boost the state's interest and economy. In the second photograph during World War II, sailors stand at attention in front of the building. 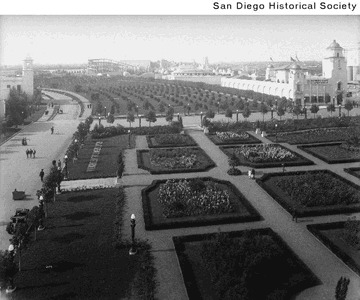 Public use of Balboa Park was prohibited during the war years. 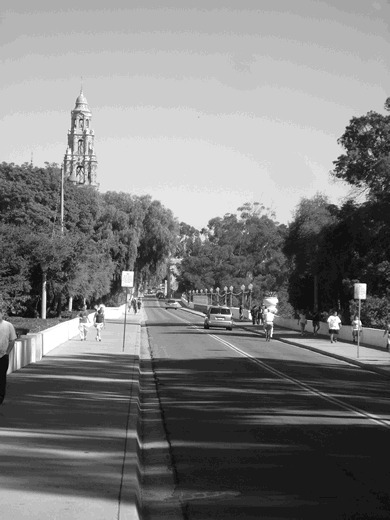 The photographs below demonstrate how diverse the use of Balboa Park is currently. Since the 1970s, the park experienced a large amount of diversified uses. Festivals, recreation, and cultural organizations now allow the visitor not only to consume established memories, but also to create their own. These photographs are but a small part of the varied ways people use the park. 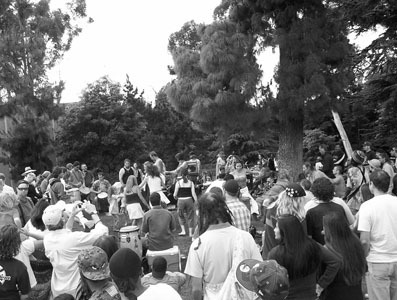 Drum circle at the Earth Day Festival in 2008. 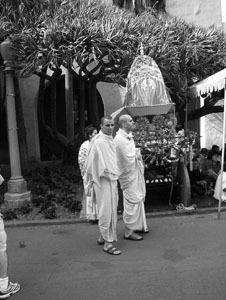 Hare Krishnas at the Earth Day Festival in 2005. 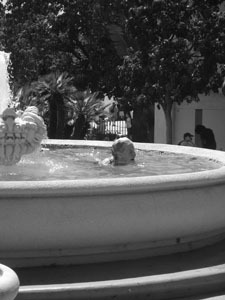 Hippie swimming in fountain at the Earth Day Festival in 2008. Hula hooping outside the Botanical Building at the Earth Day Festival in 2008. Cooling off at the Earth Day Festival in 2008. The Pride Parade in 2008. The Centro Cultural de la Raza in 2009. 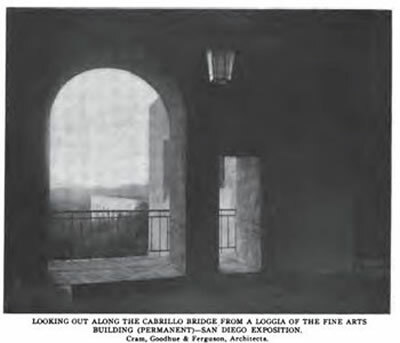 Finally, the following photographs are of the Cabrillo Bridge and California Tower (now the Museum of Man.) 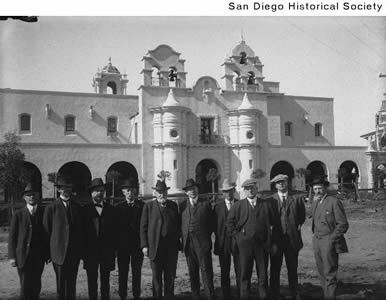 They are, perhaps, the most recognizable structures in Balboa Park and San Diego and have been part of the city's landscape for almost 100 years. The National Park Service's National Register of Historic Places recognized it as a historic site in the late 1970s. Some sections of the park have not changed drastically, and continue to delight resident and visitor alike.